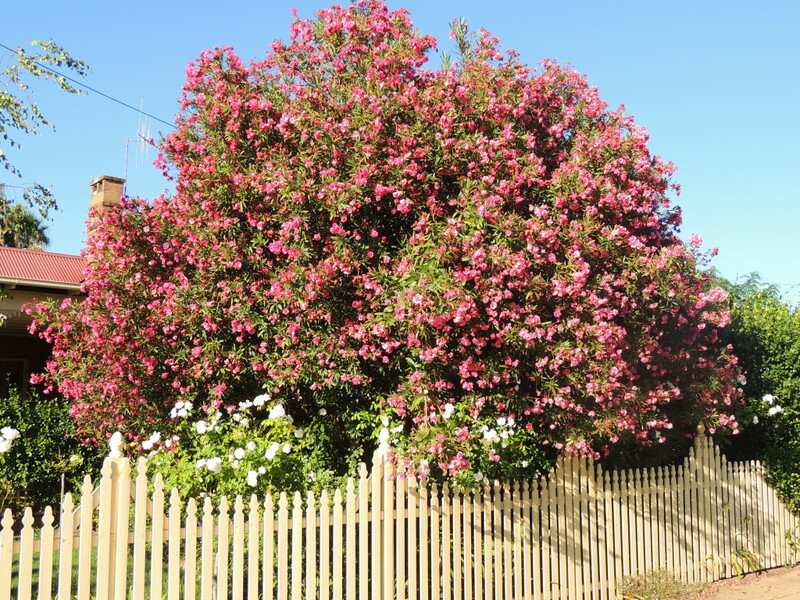 The oleander is a much under-valued shrub, but it can be found all over Australia in public places such as cemeteries, churchyards and old parks, as well as being used as a street tree, often on beach fronts. The fact that it is poisonous in every part puts people off planting it in their gardens I think, and yet it gives such a wonderful, colourful display right through summer and into autumn and lives happily while being completely neglected, in every type of soil. 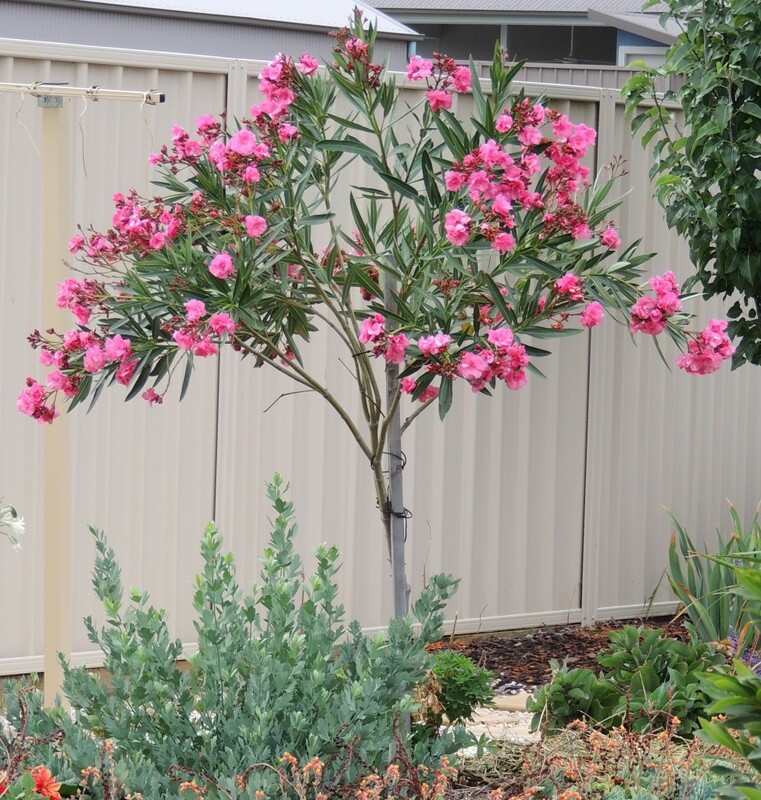 There is no need for the home gardener to worry about cultivating it as sensible precautions such as wearing gloves when working with oleanders and disposing of prunings carefully will ensure there are no ill-effects. After seeing oleanders in Seville, Spain which were being grown as trees with a single trunk, I decided that this is what I would like to do in my own garden. My oleander is only just over a year old and it's as determined to be a many-trunked shrub as I am for it to be a tree, doggedly putting out shoots as quickly as I take them off. I'm not sure at the moment who is winning, but I think I may just have the edge. For the time being, anyway. Until recently I believed that the oleander is related to the olive tree but it seems that this may not be correct and that people think this because of the similarity in the leaves. This makes sense really, because of course olives are not poisonous, even though their fruit is very bitter until it has gone through a pickling process. The Greek word for olive is olea which forms the beginning of oleander. There is a story I like about how the oleander got its name. A young man called Leander was in love with a Greek damsel, but sadly he was drowned in a ferocious storm at sea. Finding his body on the shore with a flower clutched in his hand, she cried 'Oh Leander, Oh Leander'. She planted the cutting and it grew-an everlasting memory of their love. Previous Post Where did all this start? What a wonderful way to start. 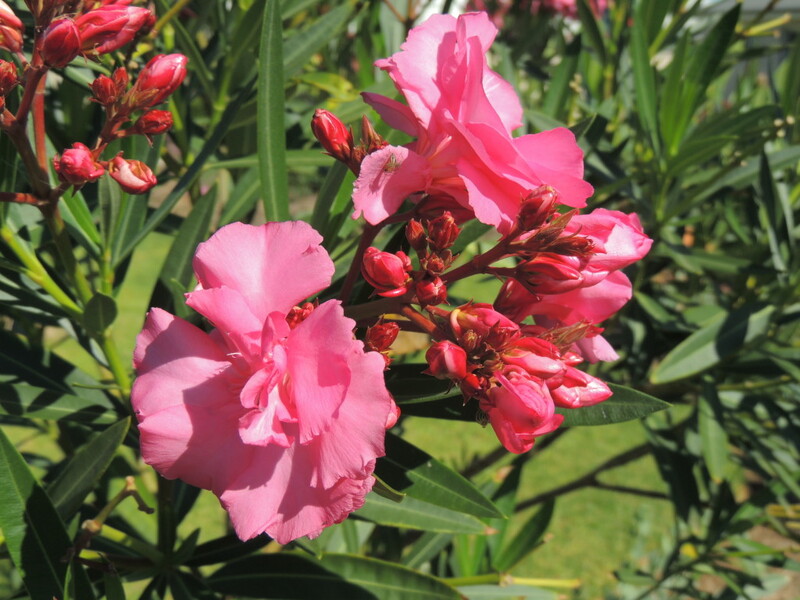 I love the article on the humble oleander. I agree it is a great asset in this climate being such a hardy plant. I look forward to seeing more photos of your property when you were out of town along with photos of your new garden in town. forward to reading it on a regular basis. Terrific article Jane. I will look forward to reading more and enjoying seeing your new garden progress.